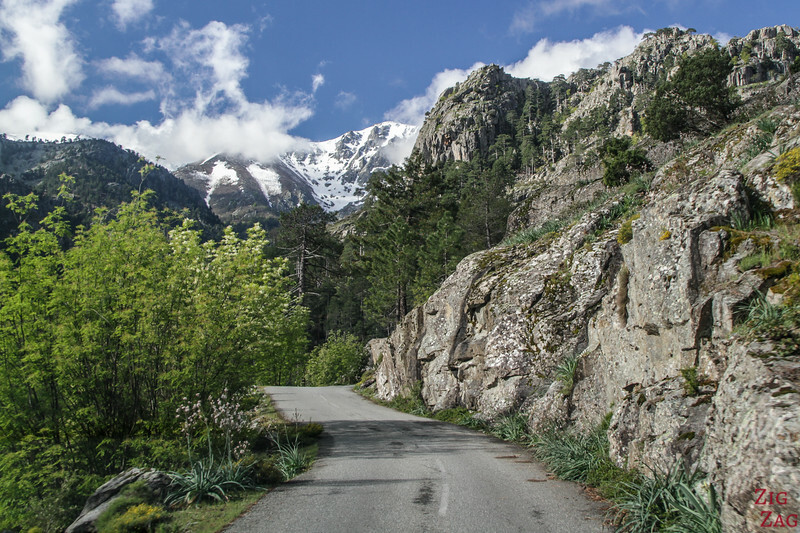 The Restonica Valley Corsica is often considered one of the most beautiful roads on the Island. 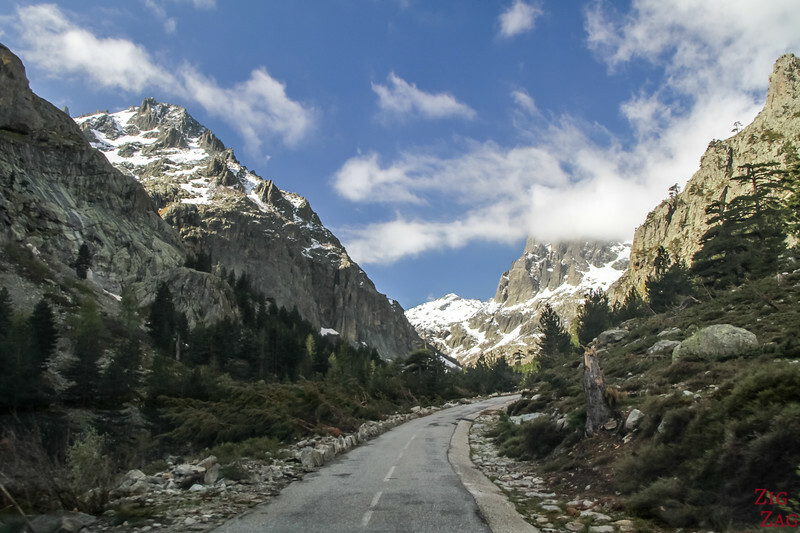 The drive is not easy, but the views are magnificent. 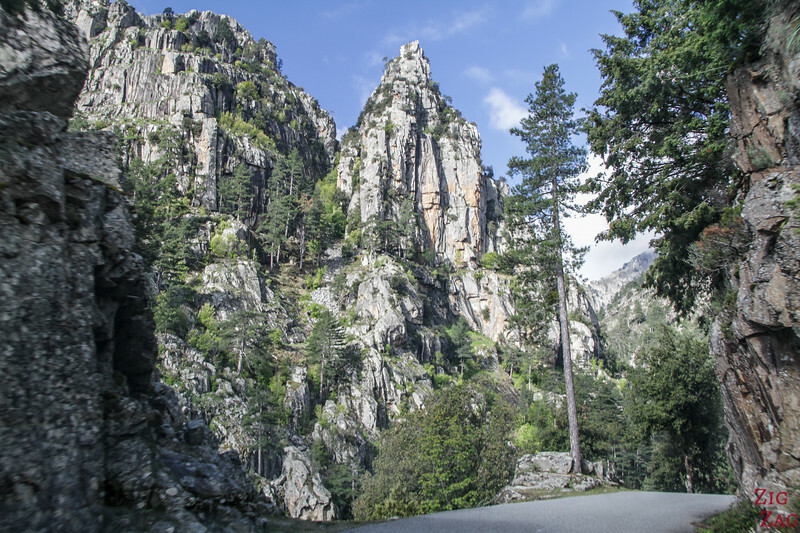 Below is my guide to plan your experience of the Gorge de la Restonica Corsica from Corte. 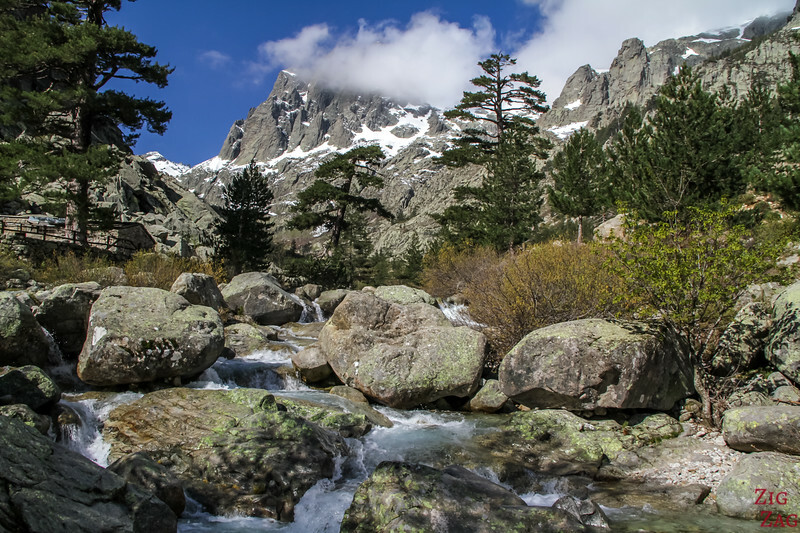 La Restonica is considered one of the most beautiful valleys and one of the best places in Corsica. Below are a few pictures to introduce the valley to you and understand why so many people love it! 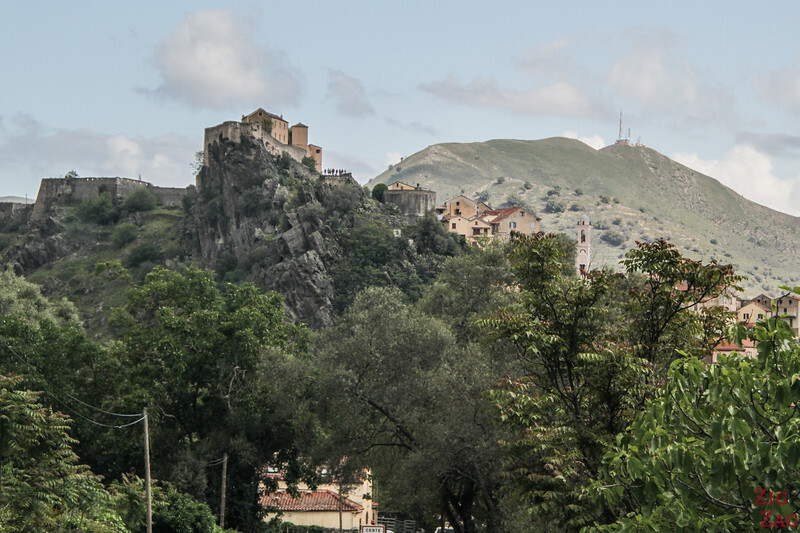 The Restonica Valley starts just behind the Citadel of Corte (West). I was surprise how close it is to town! 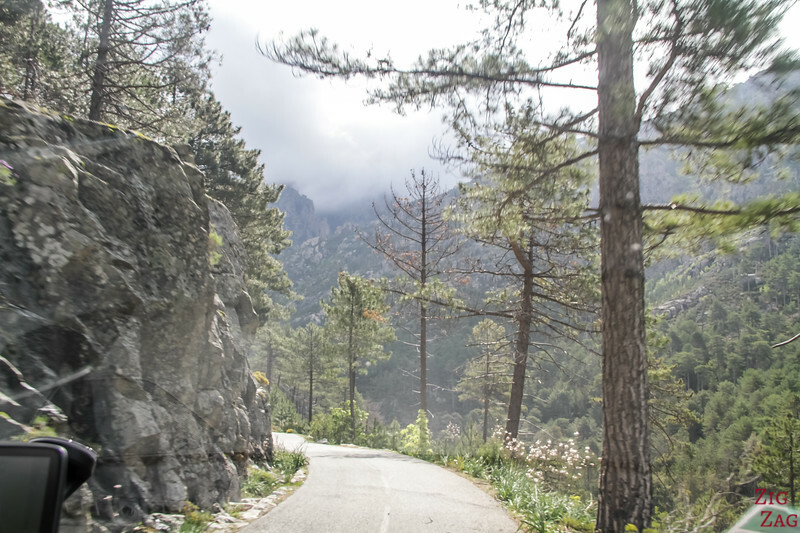 I recommend to stay in Corte so that you can start the drive as early as possible and avoid the traffic on this narrow road. Check out the best rated accommodations in Corte. 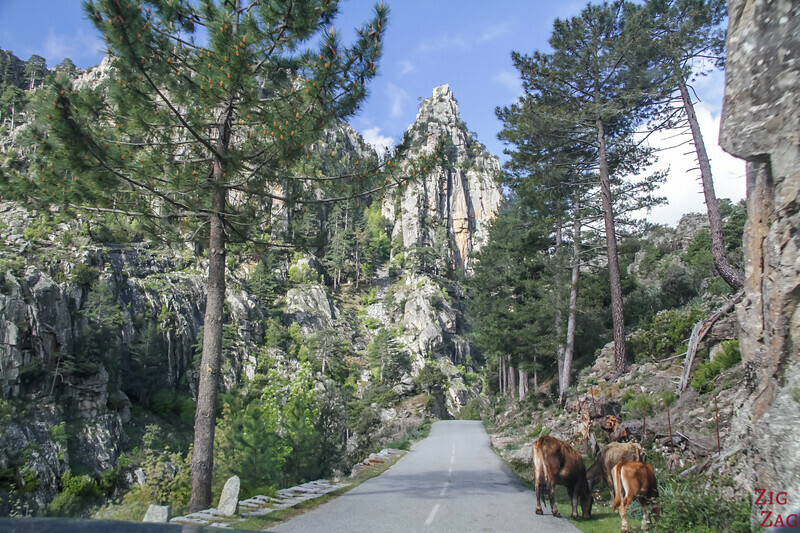 Want more ideas about where to stay in Corsica? Check out my accommodation article. For most of the drive, the road is not very wide. There is one lane in each direction. 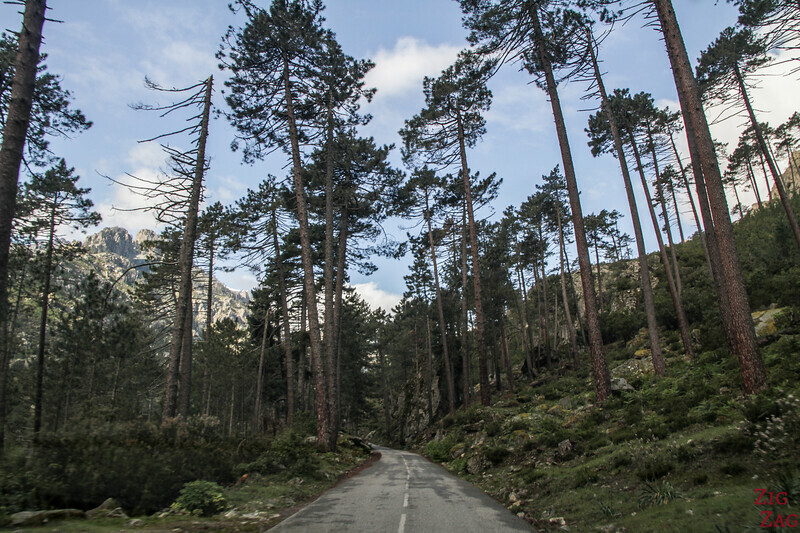 When there are trees around, it is not difficult, you just have to slow down when a car comes from the other direction. 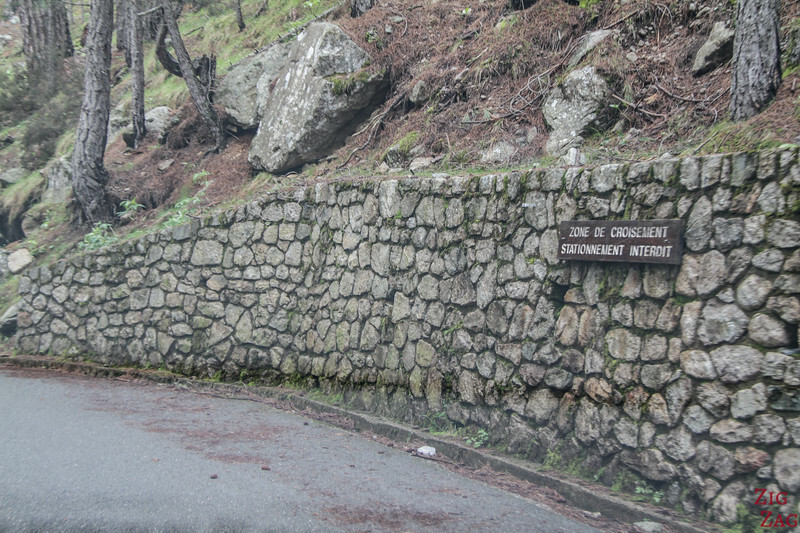 However sometimes, when the gorge walls get closer, the roads is much more narrow, with a dramatic drop on one side. That's why there are passing places in many location. they are called 'Zone de croisement' and they are only to cross path with other cars. Parking here is forbidden. Always look ahead and stop in the passing places if it is on your side to let the other car drive past you. And to make matters worst, there are animals roaming freely on the roads. So be careful at every turn! If you have any anxiety about driving, I would recommend not going. 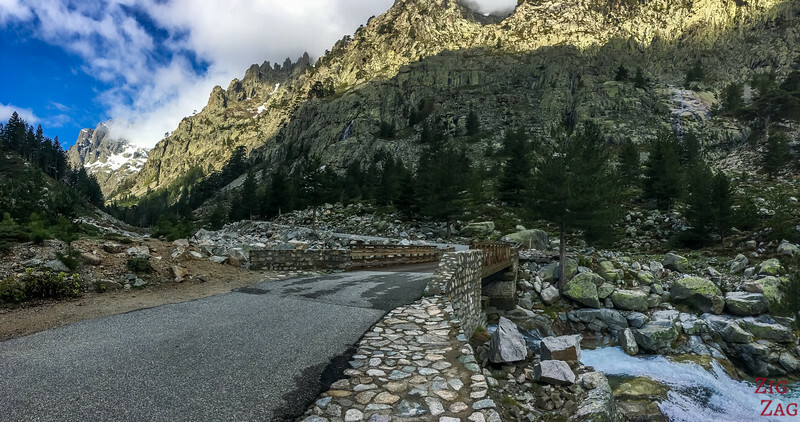 There are other many dramatic mountain roads in Corsica that are far easier. It is beautiful but not worth the stress. 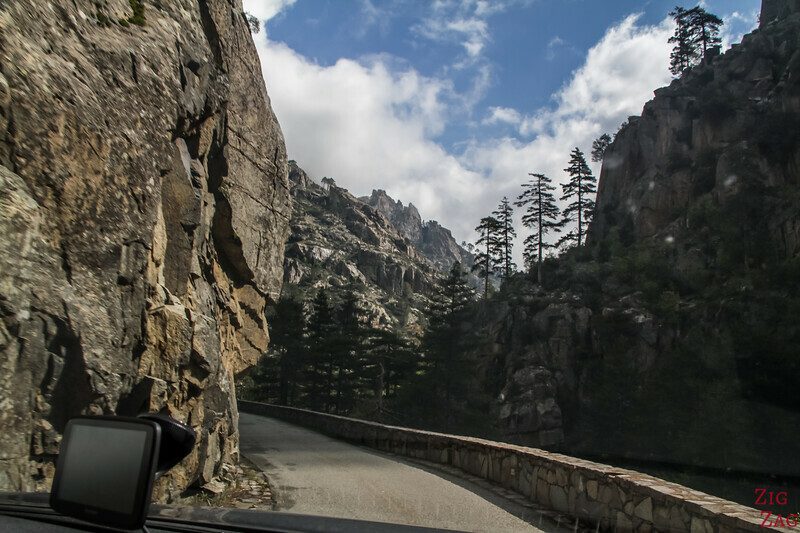 If you want to know more about the roads in Corsica, check out my guide to driving in Corsica. All the bottom part of the valley of Restonica is free to access. 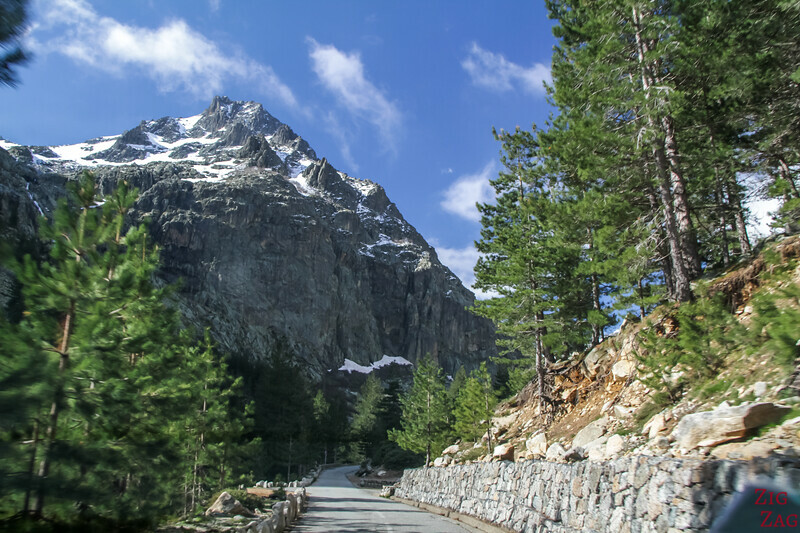 It is a winding road offering stunning views at every turn. Off season, you can see a little bit of snow in the mountains. 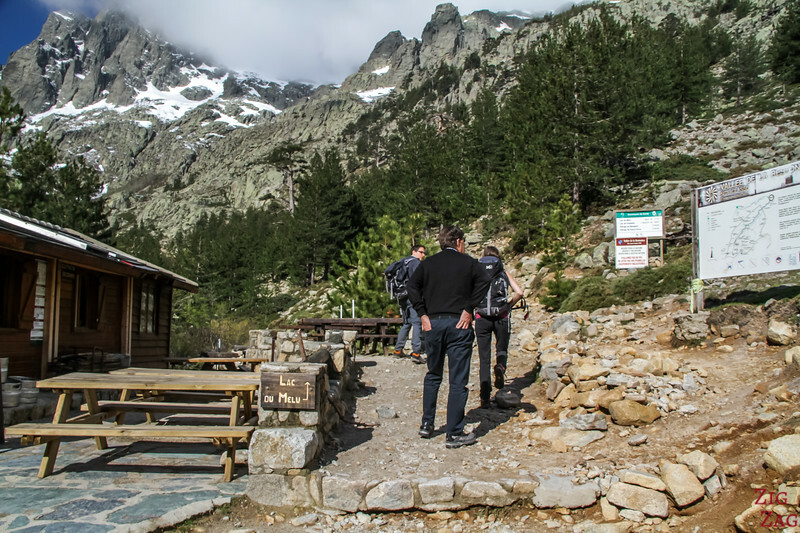 Some of the peaks are over 2000m. 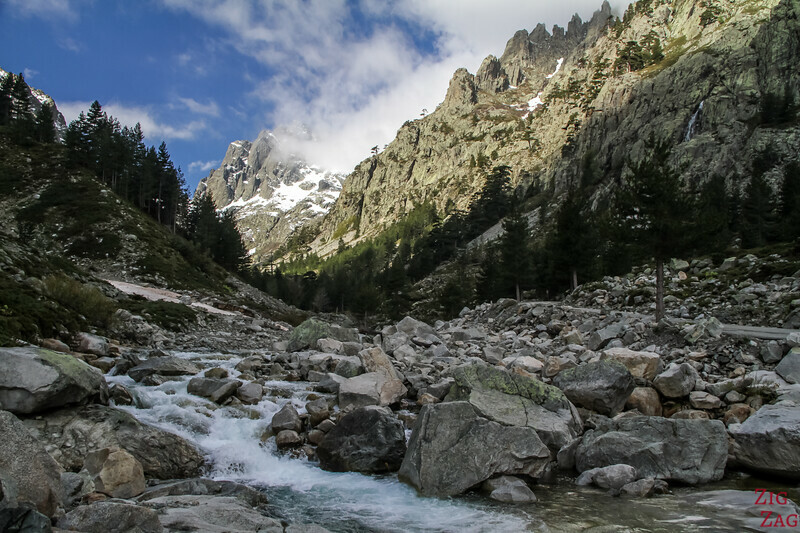 The Restonica river starts at Lake Melo (at 1711m in altitude). 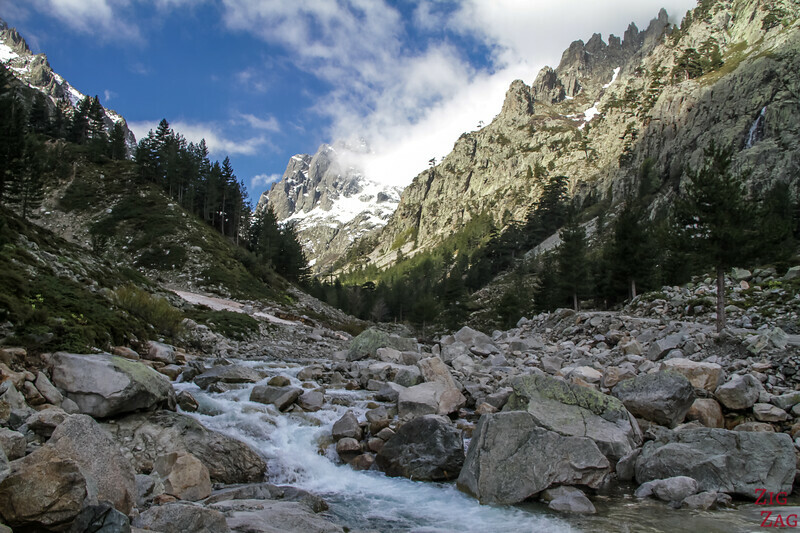 It flows for 18km before reaching the Tavignano river in Corte. 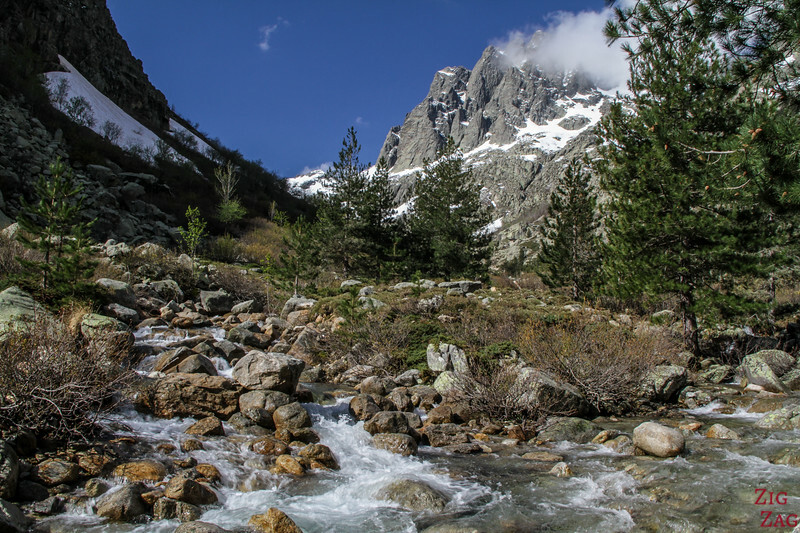 In spring, the snow is melting and the river is rushing. But in Summer it is calmer. The water has an emerald colors and there are great pools to soak in. Just don't stay near the river in case of storm. You will be crossing the Restonica river twice along the journey. The first bridge does not have a view, but the second crossing towards the end is phenomenal! You have a great view towards the end of the valley. And if they are not in the clouds, you can see the needle type summits. Towards the end you will see a booth with a representative of the area (sorry I forgot to take a picture). 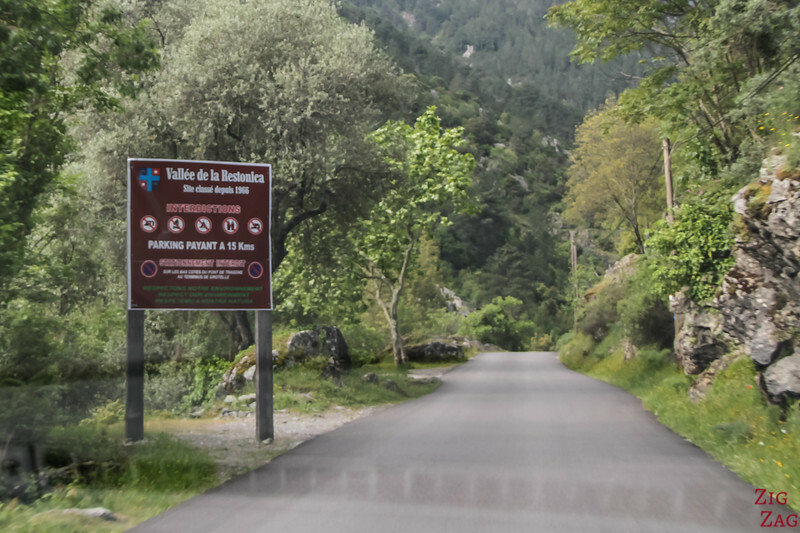 You have to pay 6 euros, to be allowed further in the valley to the last carpark. From there the views are splendid. You are much higher in the mountains and the circus at the end of the valley is stunning. 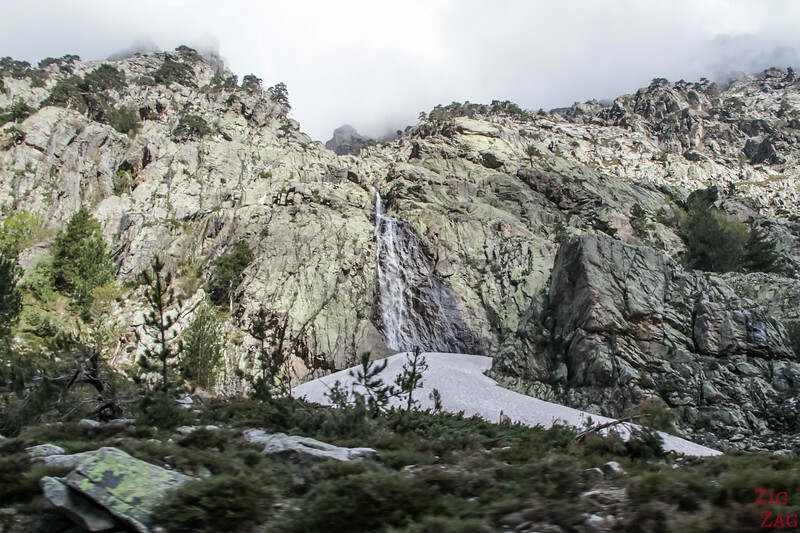 If you are there in Spring, you might still see snow and waterfalls on the walls of the Restonica gorges. 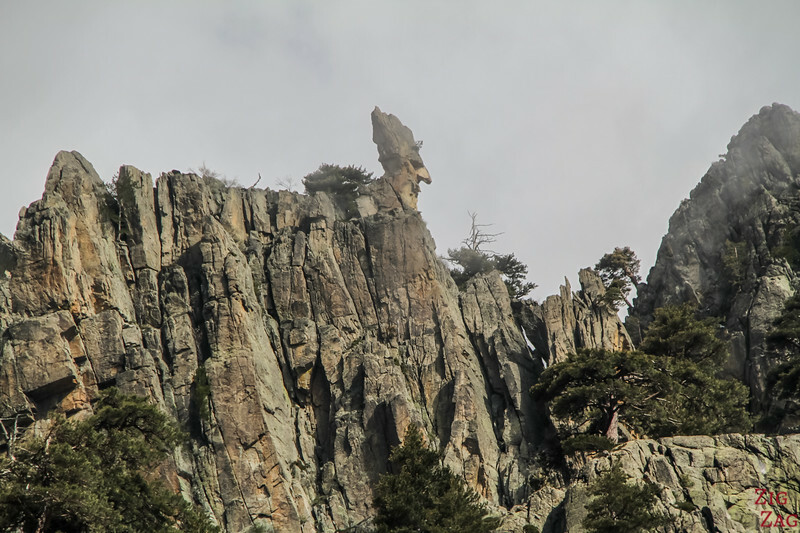 And don't forget to look up, you might imagine a lutin in the rocks like I did! 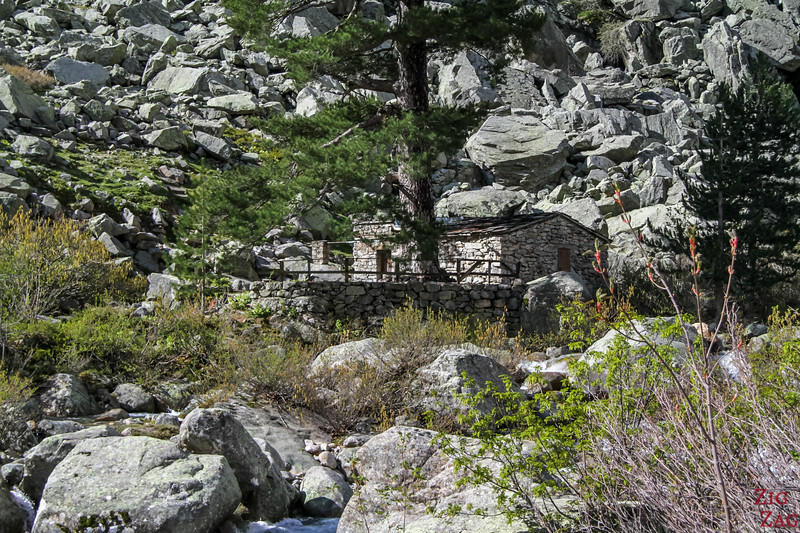 At the end of the Restonica valley, just before the carpark and the café, you can see some small stone buildings around the river. 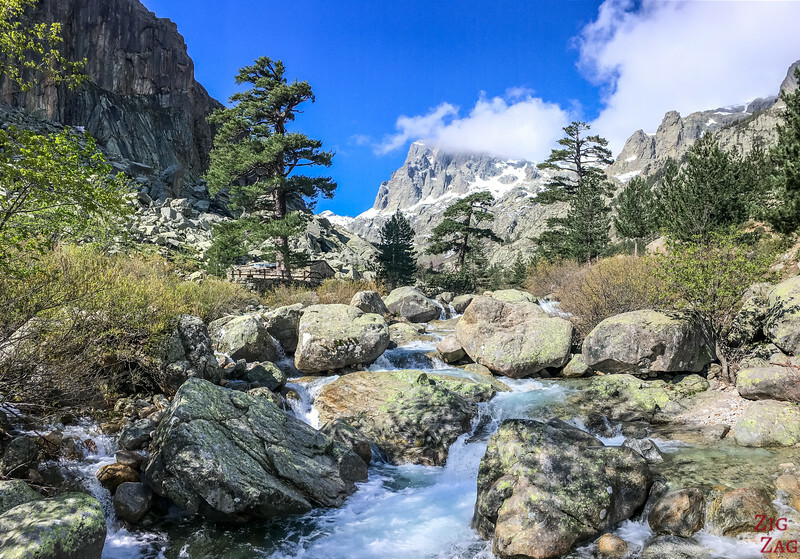 If you don't go for the big Melo Lake hike, you can just walk around the river and admire the location. I think that even if you are not hiking like me (I had a sprained ankle) you can enjoy the drive all the way to the carpark. 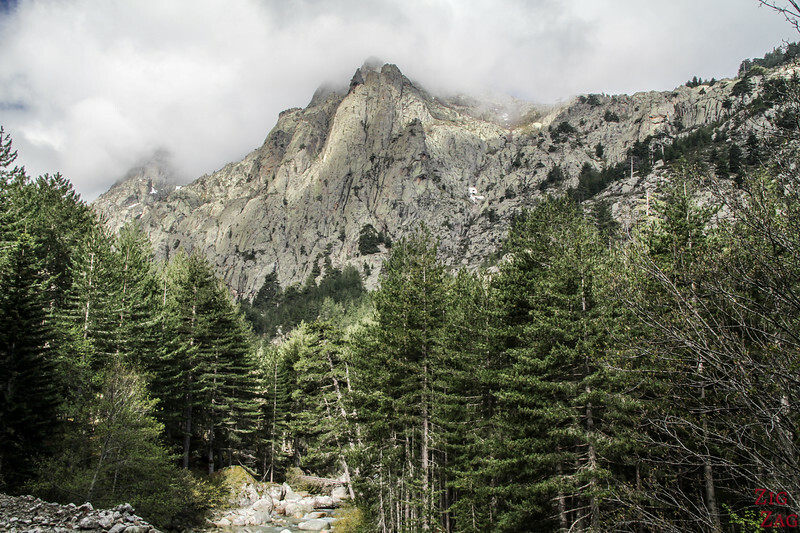 However most visitors, come to reach lake Melo and Lake Capitello. 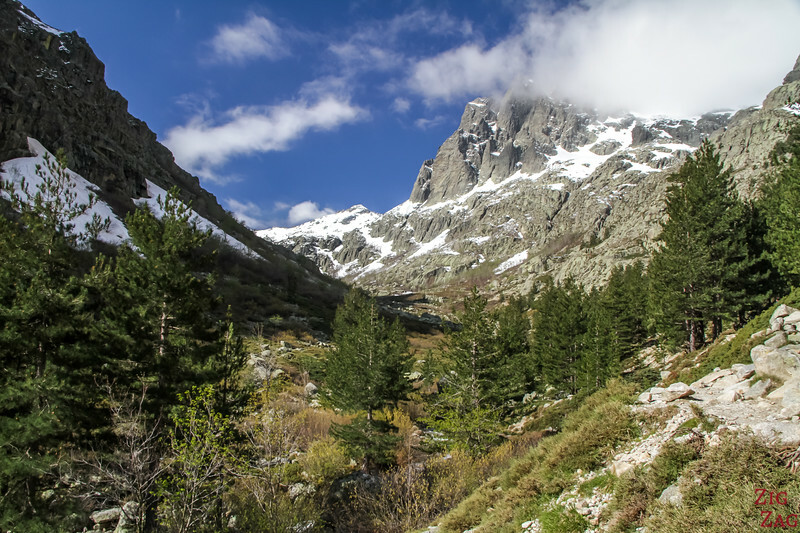 This is one of the most famous hikes in Corsica. From what I read, it is not as easy as some website let you believe. Check you the comments on Tripadvisor to take your decision based on your fitness level. 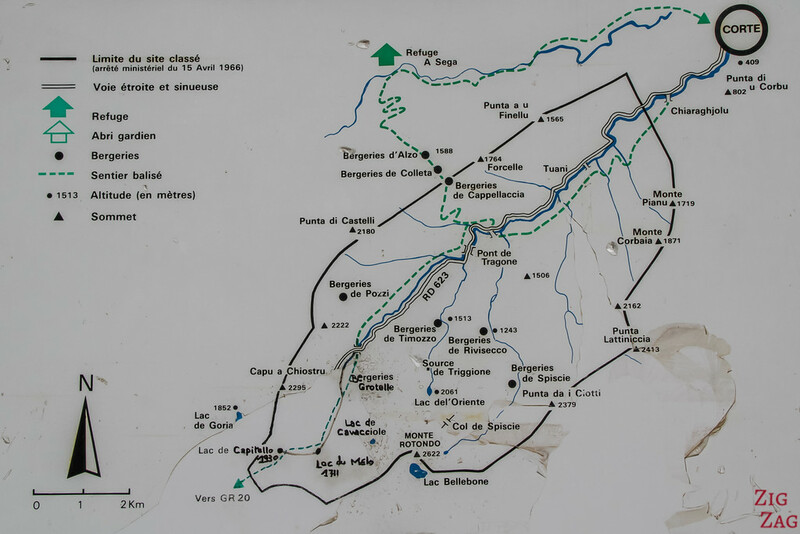 Below is the map displayed at the beginning of the walk. Lac de Melu is the other spelling for Lake Melo. 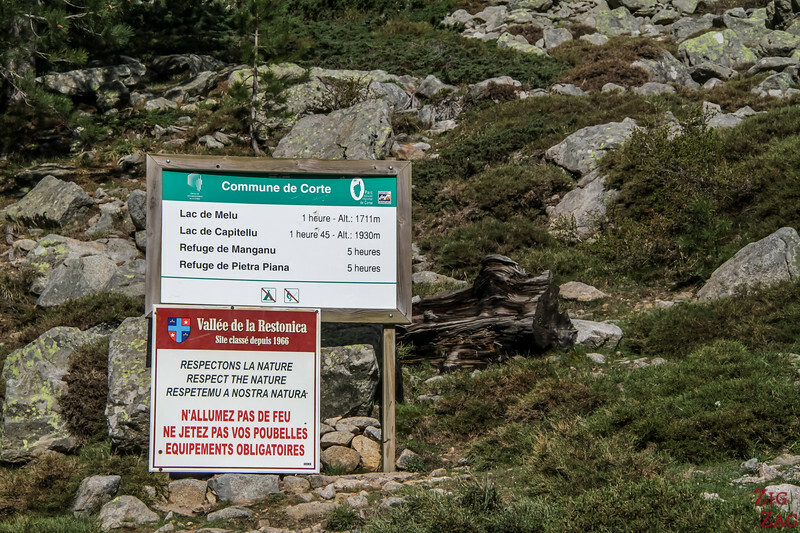 It is written 1h but most people report 1h30 or 2h to reach it. The altitude of Lake Melo is 1711m. The best view is actually from Lake Capitello at 1930m (I think). You must wear proper hiking equipment. 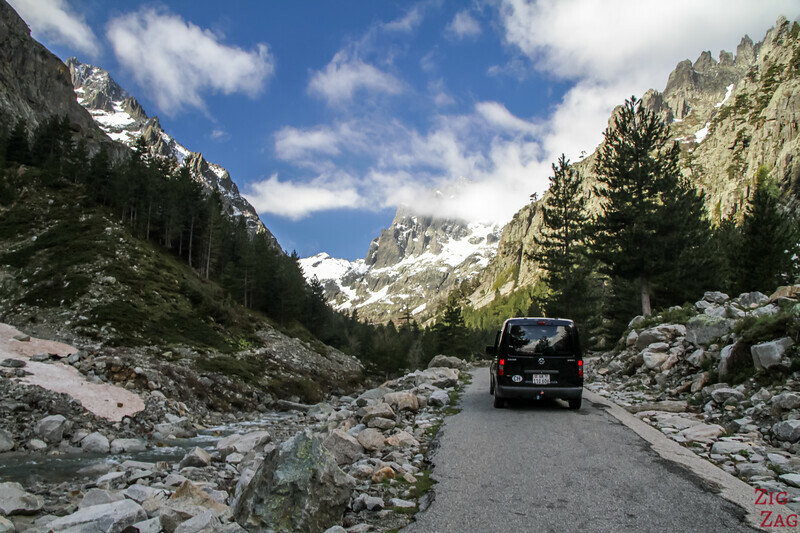 For a narrow canyon with rocky wall on each side : The Inzecca Canyon just south of Aleria. The drive is short but very impressive and a lot easier! 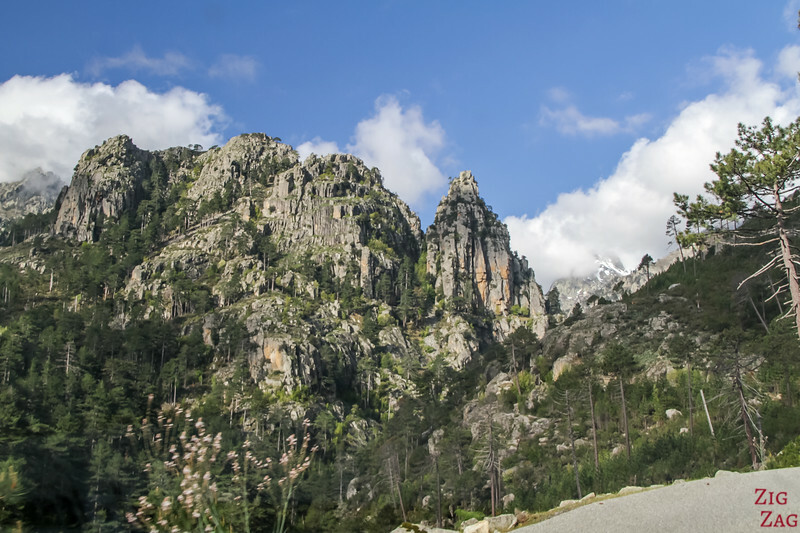 For a emerald river with mountain views : one of my favorite drives in Corsica was the Solenzara Gorge all the way to the Bavella needles. It is a large road all the way with one lane in each direction. Many carparks to access the natural pools. 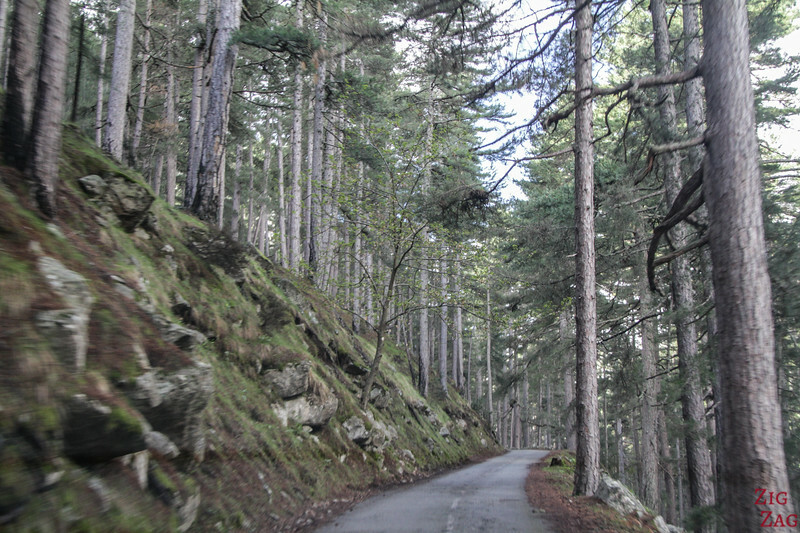 Do you enjoy winding mountain roads?